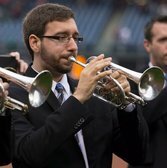 Mr. Michael Daly holds a Master’s Degree in Trumpet Performance from Rowan University and a Bachelor’s Degree in Music Education from West Chester University of Pennsylvania. During his graduate studies, Michael was a featured soloist with the Rowan University Orchestra. He is currently the Director of Bands at Pleasantville High School. Mr. Daly is also on Brass Faculty at Rowan University’s Rowan Prep program. In addition to his teaching responsibilities, he has played Solo Cornet in the Atlantic Brass Band. During his time with the band they have won the North American Brass Band Association Championship in 2010 and 2011 and competed in the World Music Championship in Kerkrade, Netherlands. He is an active member of the National Association for Music Education, South Jersey Band and Orchestra Director’s Association, International Trumpet Guild, and North American Brass Band Association. Michael’s primary teachers include Kenneth Laudermilch, Jean-Christophe Dobrzelewski, Bryan Appleby-Wineberg, and George Rabbai. This band really swings! Advanced musicians play pieces with more complicated jazz rhythm. Many students play in both Jazz and Concert Bands. Designed for the more advanced student musician, Concert Band students learn ensemble pieces that expand their musicianship. Concert Band members are joined by several adult musicians who are excellent models for the students. Seasonal and outreach concerts mark the highlight of the year.